Hi friend! Well fall seems to be on the way what with the evening chill and all the plaid button ups I’ve been seeing around town. And in some unlucky parts of Alberta, winter has even reared her ugly head in the form of snow… that’s right. Snow in September. Blech. That being said, with the evenings getting crisper and the harvest pouring in, now is the perfect time to take advantage of the abundance of fresh produce in all kinds of exciting ways! And what better way to take advantage of some super ripe pears than to turn them into tasty muffins? 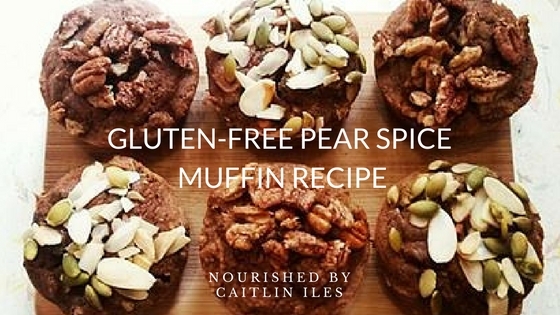 Thus the Grain-Free Pear Spice Muffin was born! With the cooler weather comes a desire for warm and nourishing treats and these muffins fit the bill with their blood sugar balancing cinnamon, digestive fire-stoking ginger, and immune-boosting cloves. Now just to be clear, taking the gluten out of a muffin doesn’t automatically make it a health food, nor does swapping out the processed sugar for coconut palm sweetener and maple syrup. Not even adding pecans for protein makes them an everyday staple. These muffins are an indulgence, a healthier indulgence than the muffin you’ll get at most coffee shops, certainly, but having one for breakfast, even if slathered in the finest grassfed butter is still not something I recommend on a regular basis if we want to keep our blood sugar balanced and our jeans comfy. That being said, autumn and baked goods really are a match made in heaven. I’ve always found the act of baking to be incredibly soothing. When I played hockey back in high school I used to bake the team cookies before every game and any time we went on a winning streak I would bake the same kind of cookie until we lost. More than anything, baking is something that is meant to be shared with the people you love or with people you’re just meeting. It’s a delicious way to build a community and show those around you just how much you care about them. This recipe is actually a three-parter since you’ll be making the pear sauce and maple toasted pecans from scratch. However, if you want to save time you can just use super ripe pears without heating them and simply dry toast the pecans sans maple syrup and sea salt. Line a muffin tin with muffin cups or grease with coconut oil. In a medium-size mixing bowl combine all dry ingredients. In a separate larger bowl mix together all wet ingredients except coconut palm sugar. Add the dry ingredients to the wet and stir to combine. Fold in the 1 cup of pecans. Add a scoop of the mix to each muffin tin, filling about ¾ of the way. Top each muffin with a sprinkling of maple pecans. Protip: You can also top with pumpkin and/or sunflower seeds, walnuts, or slivered almonds. Try dry toasting the mix to add an extra layer of flavour. Bake at 350F until the muffin centre bounces back after being pushed down, approximately 35 minutes. Place on a cooling rack. Makes one dozen muffins. They freeze well so you can keep them fresh. Cut pears into small chunks (you may wish to peel them, but if you puree the sauce it’s unnecessary). Place in a saucepan over low-medium heat with butter/coconut oil and vanilla. Stir in spices until thoroughly combined. Turn heat to medium until large bubbles begin to break on the surface, stirring occasionally. Once bubbles form, reduce heat to low and simmer about 20 minutes. Stirring every five minutes. You want the liquid to reduce slightly so the mixture isn’t so wet. Optional: Puree sauce for a smoother texture. Heat a frying pan over medium. Once hot, add pecans and toast until fragrant and slightly browned, approximately 4 minutes. Stir regularly. Add maple syrup and mix pecans until coated. Sprinkle with sea salt and mix. Stir over medium heat 3 minutes. Remove from heat and spread out on a lined plate. Well that’s all for today friend! If you’re looking for another delicious muffin recipe, make sure you check out my Grain-Free Banana Chocolate Chip Muffins right here!